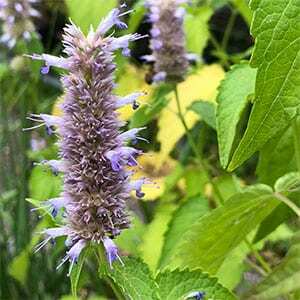 If you are looking for a long flowering easy care perennial with blue flowers, then Agastache ‘Blue Fortune’ could be it. Aromatic foliage, which when brushed gives of a anise – mint fragrance, flowers that act as bee magnets and also attract butterflies and nectar seeking birds to the garden are all additional pluses. This is also a sterile cultivar, so it will not self seed. It will spread to form a small clump, however is not an invasive thug in the garden. Excellent in the garden border as filler with a touch of class. In a well drained soil and a sunny position this is a very easy care plant. Good drainage over winter is essential. A application of mulch around the plant in spring will help maintain a moist cool root run through summer. Agastache ‘Blue Fortune’ can be pruned back at the end of winter to remove old flower heads and tidy up the foliage. Spent flowers heads can be trimmed back to help promote a second flush of flowers. An organic type fertiliser applied in spring will promote good growth. Soil – Well drained, humus rich soils with some summer moisture. Height – To around 1 metres. Spread – To around .8 metre. Flowering time – spring through Summer.